And while these Kindy Kits give kids all the items they need for a day at kindy, making sure they are kindy-ready also relies on providing them with access to the range of services available through the IUIH Model of Care. Such services include speech therapy, audiology and eye health checks to make sure they can participate and develop the skills they will need when they go to school. We are already experiencing huge demand for the Deadly Kindykits. 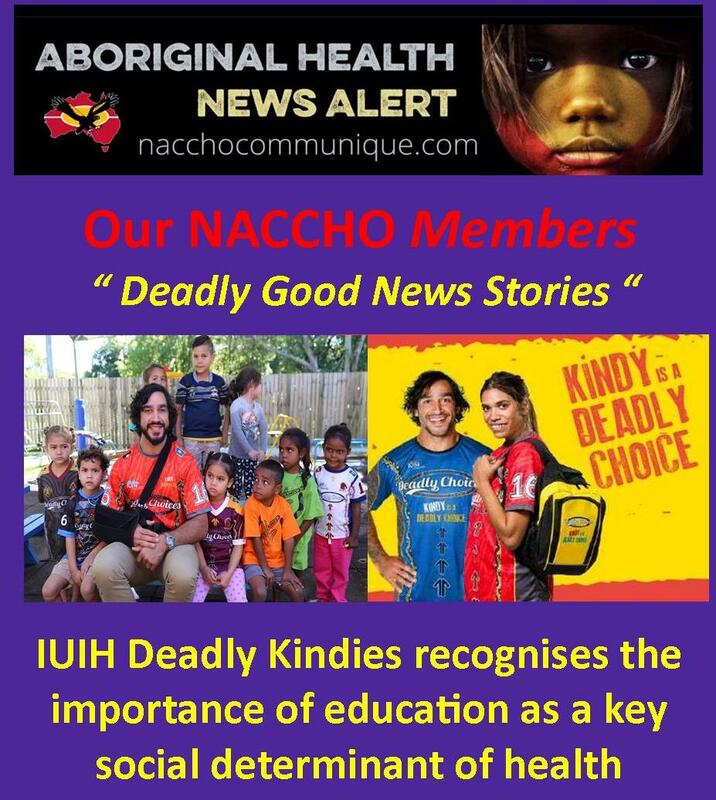 IUIH CEO Adrian Carson said Deadly Kindies recognised the importance of education as a key social determinant of health. 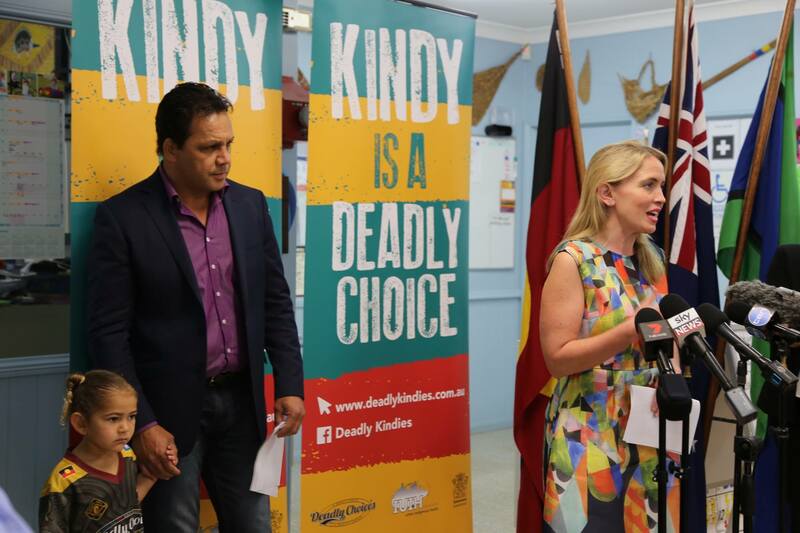 Education Minister Kate Jones and ambassador Johnathan Thurston today officially launched a new campaign to get more Aboriginal and Torres Strait Islander enrolments in kindergarten. Ms Jones said ‘Deadly Kindies’ – launched at C&KKoobara Aboriginal and Islander Kindergarten in Zillmere – was about giving Aboriginal and Torres Strait Islander children a better start to health and education. “We want all Queensland children to get the best start to their education,” Ms Jones said. “Deadly Kindies will encourage families to register their interest for kindy at their three and four-year-old’s health check. 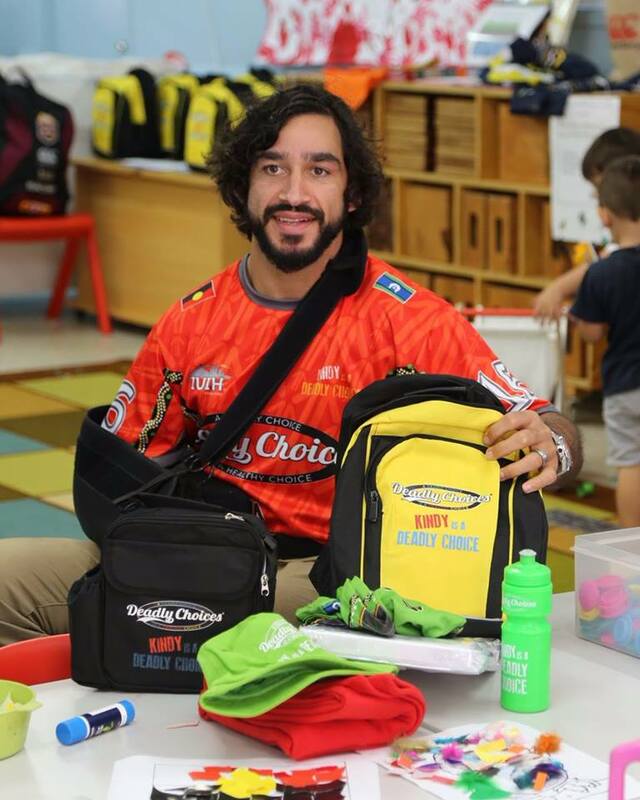 “Families will be given an opportunity to register their young children for kindy and they will also receive a free Deadly Kindy Kit. “Families will also receive any necessary support and information they need to go ahead and enrol in a local kindergarten. Ms Jones said the Palaszczuk Government had invested $1.5 million to deliver the program through the Institute for Urban Indigenous Health. 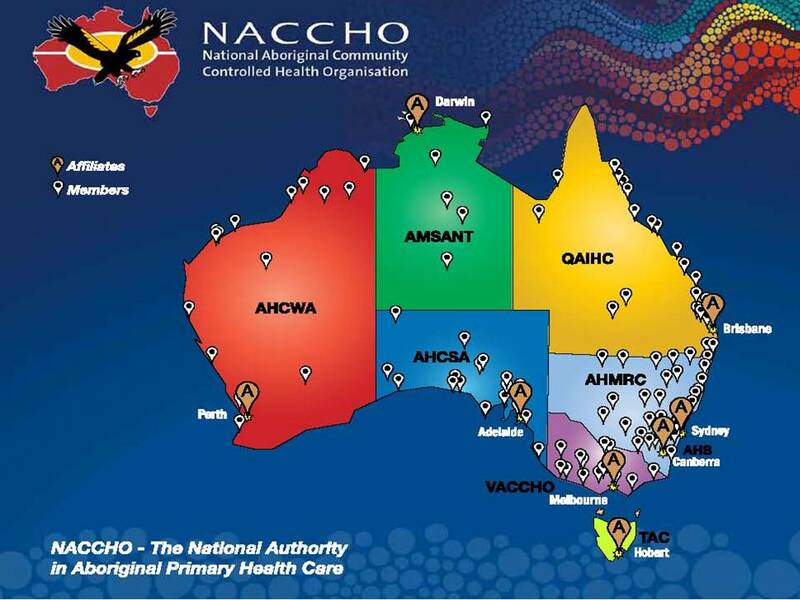 “The campaign’s strength lies in its holistic approach to supporting Indigenous children, by linking better start to health with a better start to education,” she said. 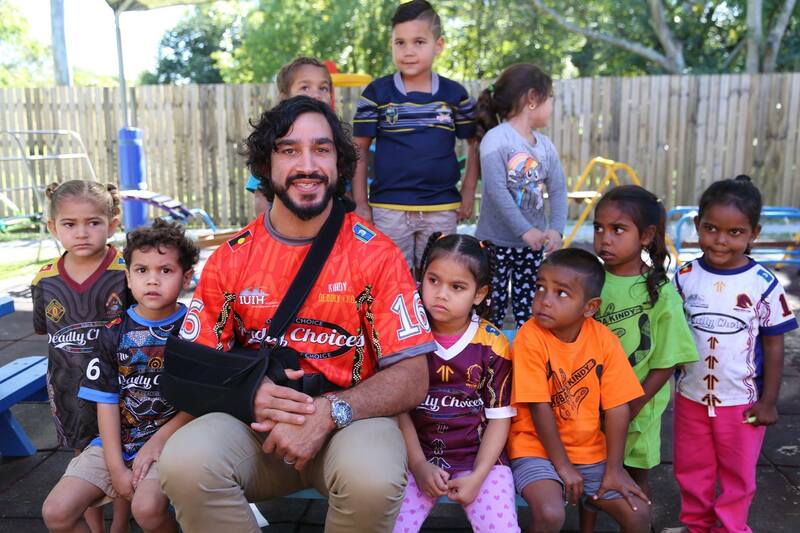 “Deadly Kindies is part of our efforts to increase Aboriginal and Torres Strait Islander kindergarten participation in Queensland to at least 95 per cent by 2018, up from 93.1 per cent in 2016. 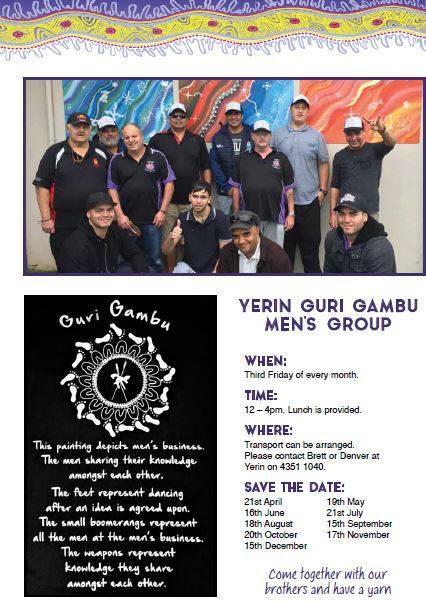 Indigenous women from across Geraldton are converging at Geraldton Regional Aboriginal Medical Service (GRAMS) three times a week to enjoy craft, cuppas, and connection. 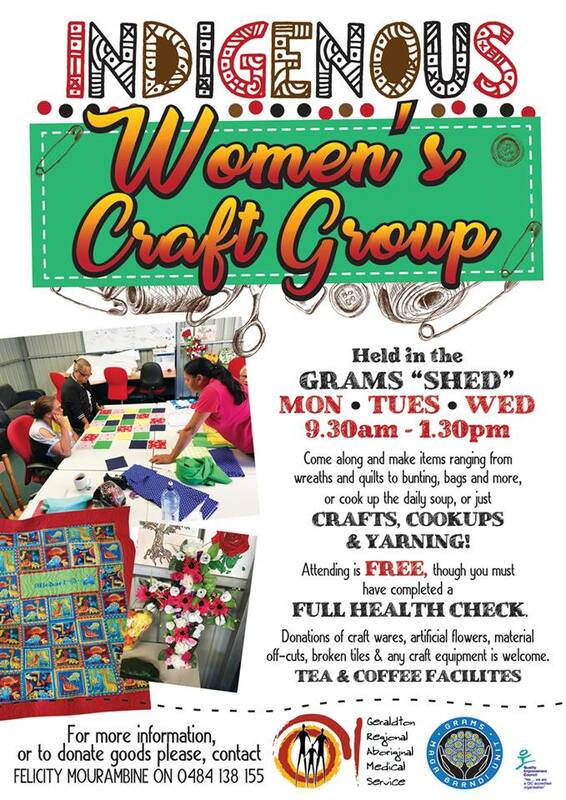 The women meet in the GRAMS ‘shed’ from 9.30am to 1.30pm on Mondays, Tuesdays and Wednesdays to make items ranging from wreaths and quilts to bunting and bags. GRAMS CEO Deborah Woods welcomed all Indigenous women to join the craft sessions, regardless of their artistic ability. “The craft group is a really lovely way for Indigenous women to come together, to not only be creative but also to enjoy the camaraderie of working together creatively,” Ms Woods said. “There are real social and mental health benefits in bringing people together to enjoy each other’s company while working on something creative and productive. Ms Woods said women who were not into craft were also welcome to attend to help produce a hot daily soup. Attending the craft group is free, and includes access to tea and coffee facilities. Anyone who takes part must first have completed a full women’s health check, get their flu shots and also have a GRAMS care plan. The group encourages donations of craft wares, including artificial flowers, material off cuts, broken tiles and any craft equipment. For more information, or to donate goods please, contact Volunteer Felicity Mourambine on 0484 138 155. 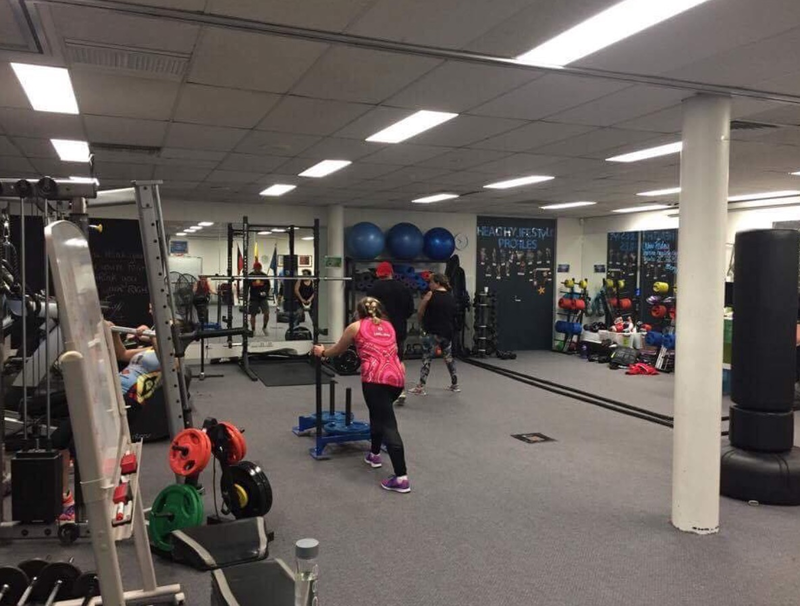 Great job to everyone who came in at 7:30am and smashed out a solid workout! 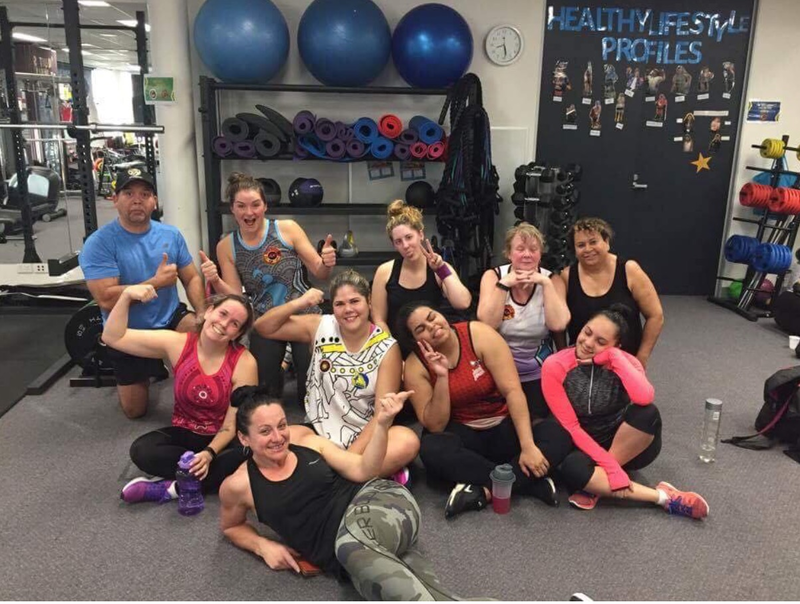 You all smashed it And especially good job to Raylene from Bendigo & District Aboriginal Co-Operative & Rudy from Mallee District Aboriginal Services who came all the way to have an awesome session! 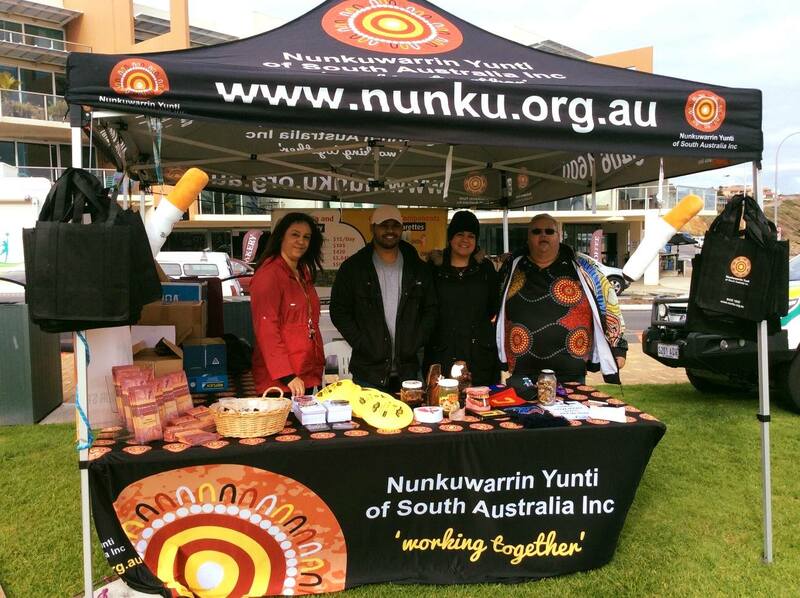 ” The Australian Minister for Indigenous Affairs, Senator the Hon Nigel Scullion announced on 7 July that it was his intention from July 2018 only Aboriginal owned, managed and controlled organisations and businesses would be funded by the Commonwealth to deliver services under the Indigenous Advancement Strategy. In making the announcement Minister Scullion said it was a decision taken on the back of incontrovertible evidence that the best outcomes being achieved under the IAS were those that were being delivered by local, community focused Indigenous managed and led organisations and businesses. The Minister effectively asserted that the evidence was in, and that the practice of Governments in turning to mainstream and church based businesses, ahead of Aboriginal organisations, was producing sub-optimal outcomes for Aboriginal people and that the Commonwealth would from the beginning of the next financial year only make funding under the IAS available to Aboriginal businesses. 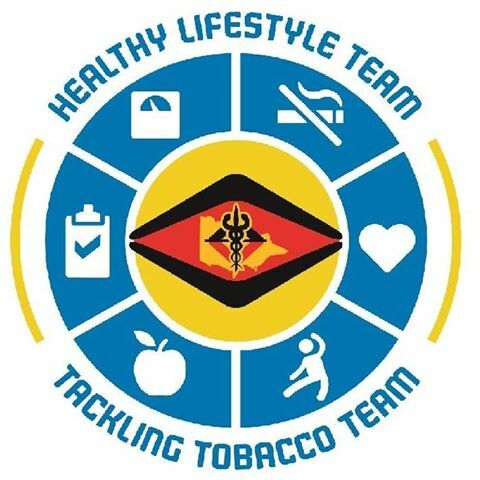 The next step in this process must be its extension to other programs and funding including of Indigenous specific programs managed by the States and Territories and of funding dispersed through the Public Health Network. It was perhaps no coincidence that the Minister’s announcement coincided with the tenth anniversary of the disastrous and racist bi partisan ‘intervention’ in the Northern Territory. 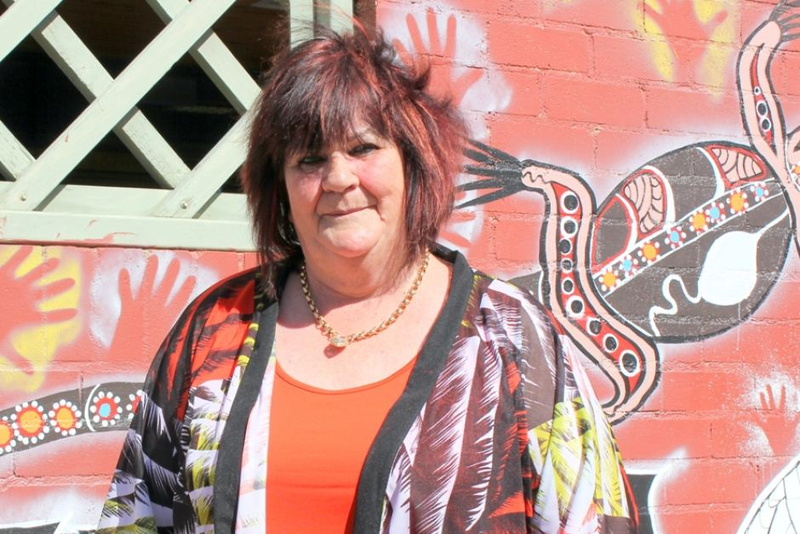 Ms Pat Anderson, one of the authors of ‘Little Children are Sacred’ and currently chairperson of the Lowitja Institute has previously summarised the rationale of Minister Scullion’s decision to turn to Aboriginal organisations for the delivery of services as being that one of the most important determinants of health is ‘control’. Through care, supported housing, care and protection, childcare, aged care or justice. 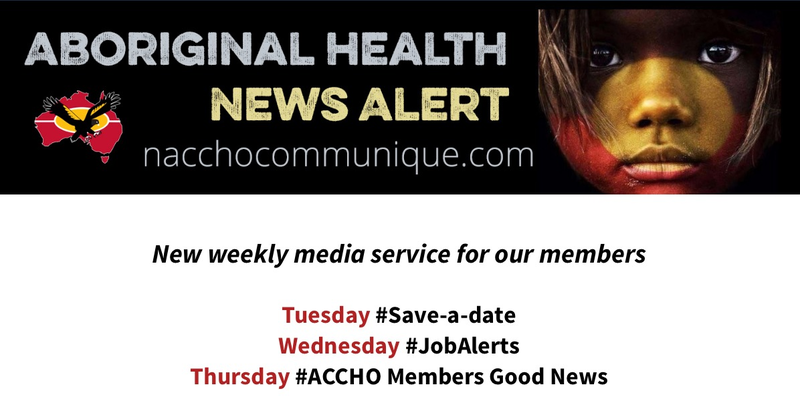 The default practice in the ACT is for the Government to turn to precisely the organisations that Minister Scullion has said the evidence shows produce sub-optimal outcomes for Aboriginal people, namely non-Aboriginal mainstream businesses and church backed businesses. Organisations which the Minister has now said will, on the basis of all the evidence, no longer be funded by the Commonwealth.